The AX type Air Seal has a simplified structure. 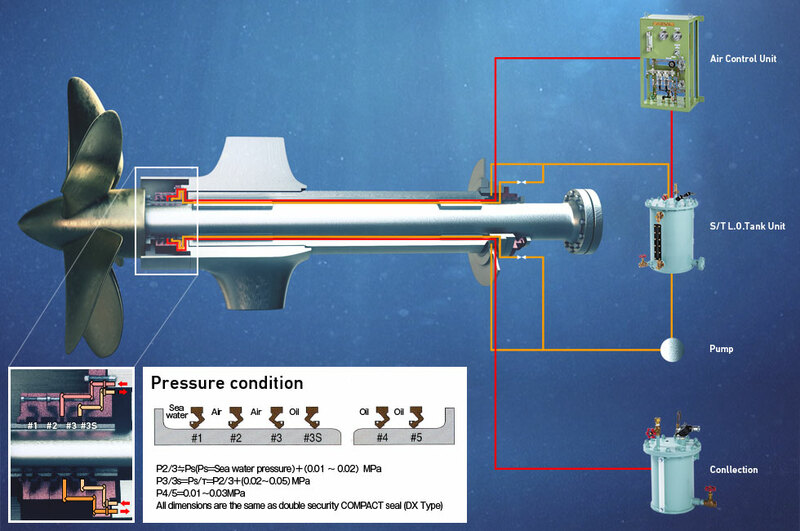 Air, supplied from the air source within the ship, passes through #2/3 chamber and is spouted into the sea water. Any change of draft is automatically detected by the air control unit and pressure is adjusted to maintain the optimum pressure on each part. The COMPACT SEAL (CX Type, DX Type) is composed of three types of metal rings (flange ring, intermediate ring and cover ring), assembeled by bolts. These metal rings form a casing, and the seal rings are tightly fixed between metal rings. The metal rings are in contact with each other, which assures that the compression of the seal rings is always aintained to the proper gegree, preventing the risk of cracks occurring by excessive pressure on seal rings. 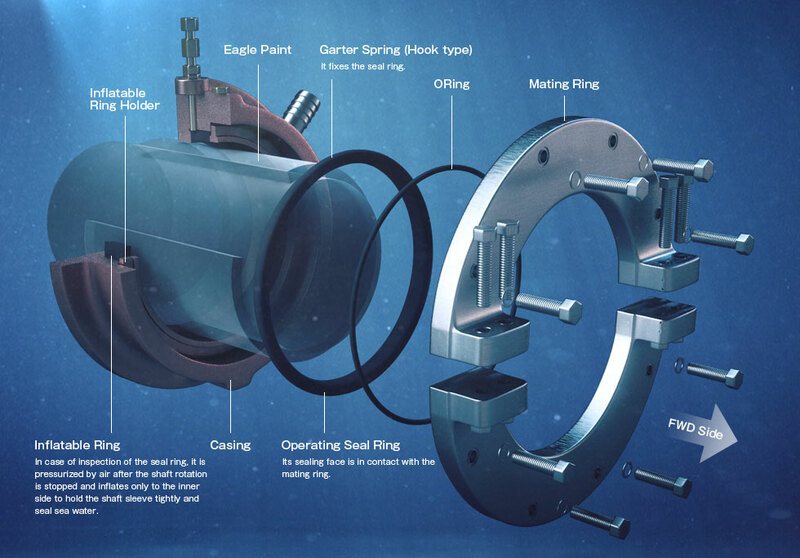 These noe seal rings are all identical in design, and normally an aft seal is equipped with these seal rings and forward seal with two seal rigns. The DX Type is equipped with one more seal ring, which works as a spare oil seal for emergency use. KEMEL manufactures the EVK type water seal. The EVK type seal has many benefits for owners and operators of vessels with water lubricated shafting. The EVK type seal is the easiest of the seals on the market for installation and operation. The seal does not wear the propeller shaft sleeve. The design of the KEMEL EVK type seal is very simple. Since it is a face type seal consisting of the seal ring and the mating ring, it flexibly copes with complicated vibration and shaft deflection and shows excellent sealing performance. All seal assemblies are supplied with an active seal and a spare seal which is installed on the shaft ready for installation.